If blondes have more fun, platinum blonde hair is the ultimate life of the party. The lightest of blonde shades, platinum is the hair color of goddesses, superstars, and edgy women who like to push boundaries. 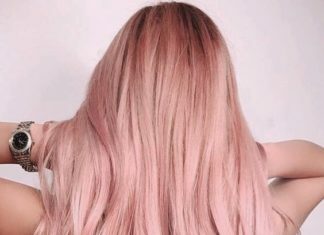 Whether you’re going for a futuristic white blonde or a vintage gold-tinged platinum inspired by Marilyn Monroe, this most coveted hair color often takes time (and money) to achieve, especially if you’re starting with naturally dark or previously dyed hair. 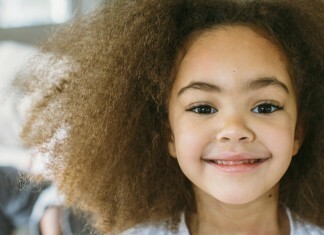 Because the lightening process can also be damaging to fragile strands, taking the platinum plunge should be done with the help and guidance of a professional stylist, so you come out looking like a sparkle-haired fairy instead of a brassy orange mess. 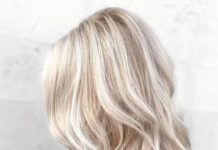 To help you decide if ultra light blonde is right for you, take a look at our 30 favorite platinum shades and styles. 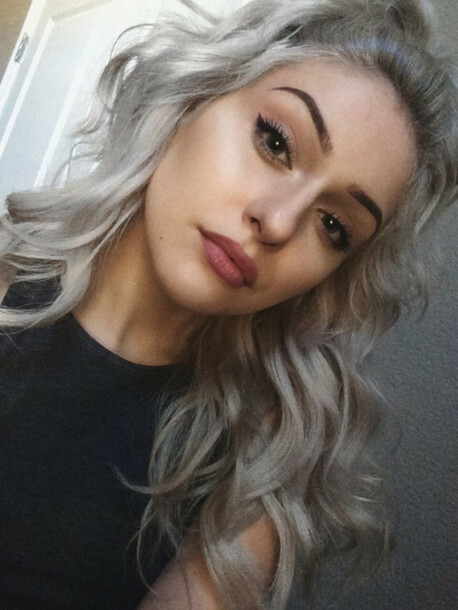 This pure platinum hair is in an ultra shiny, metallic shade that perfectly compliments makeup in bronzy or neutral shades. 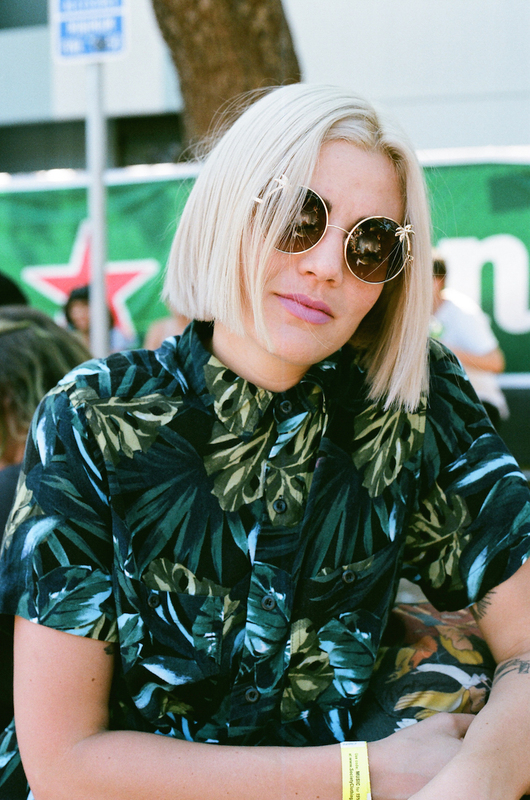 A chin length blunt cut always makes a statement, but even more so when it’s platinum blonde. If you’ve got thin hair, this trendy cut will make the most of your natural volume, and layering platinum over a darker blonde shade can help to create an added illusion of depth and thickness. If you want people to think you may have been born with that platinum hair, subtle dimensional color is key. 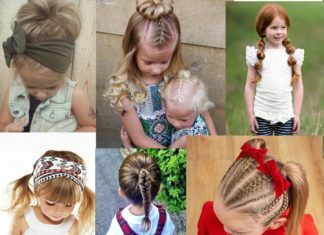 This style mimics natural hair color by incorporating several shades that are close together, and progressively lightening from roots to ends. Putting a bright blonde spin on the demure pixie that we’re used to seeing on brunettes, Michelle Williams’ super short style proves that platinum works in even the most sophisticated of styles. 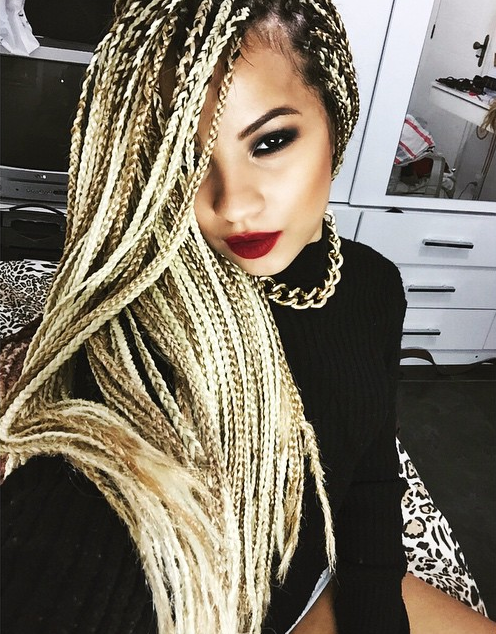 If you’re using extensions in your ultra long box braids, why not have some fun with the color? This protective style lets you go platinum with no commitment or damaging lightening process. As someone who’s been platinum blonde forever, Gwen Stefani has the shade down to a science. Her light locks usually feature a golden tint that makes her style the perfect mashup between vintage elegance and modern edge. If you’re worried that going platinum means you’ll have to lose some inches, why not go for a new bob and bangs at the same time? This straight, lash grazing fringe lends a rebellious vibe to the look, and is perfect for women who don’t want their platinum hair to look sweet or angelic. 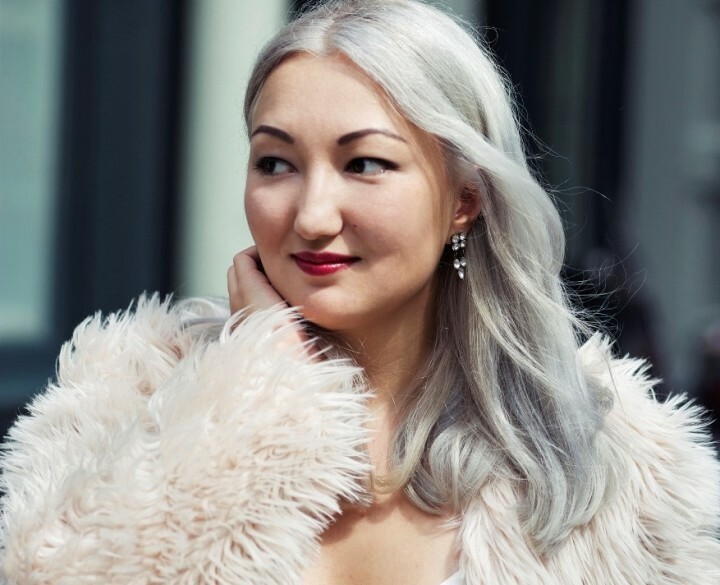 If you want to blend a little silver style into your ultra light hair color, this platinum grey shade is the perfect mixture of bleached blonde and granny grey. Known for her bright, bold, but ultimately feminine fashion choices, Amber Rose loves wearing her super short hair in an almost white shade of platinum, proving that this color can make any length or style pop. 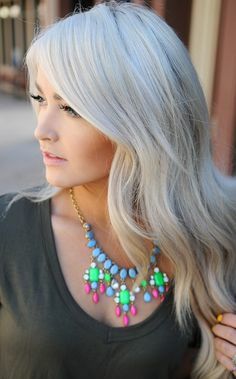 While platinum hair rarely occurs naturally, women with blue eyes and porcelain skin have the best chance of being white blonde without the help of bleach and a great stylist. In this simple style, pure platinum color on a straight, low maintenance cut will have it so only your stylist knows the truth behind your color. Rita Ora’s light olive skin is the perfect canvas for white blonde hair and crimson lips that make her look like a modern, edgy reincarnation of Marilyn Monroe. 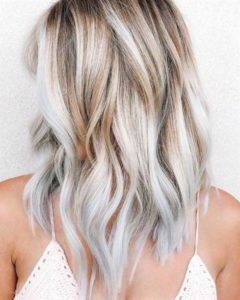 If you’re looking to do something different with your light blonde hair, platinum is the perfect canvas for playing with pastel color. 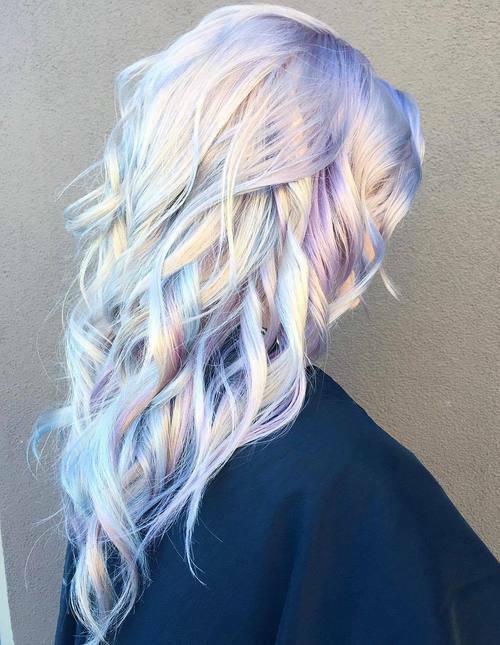 This style features soft purples and blues that look like iridescent fish scales when paired with a white blonde base color. If you’ve already got platinum hair, you can get a mermaid style at home with semi-permanent dyes for a low commitment experiment with the fantastical hues. This shorter, layered cut has tons of movement and its bold dark roots make a statment that’s both sophisticated and edgy. 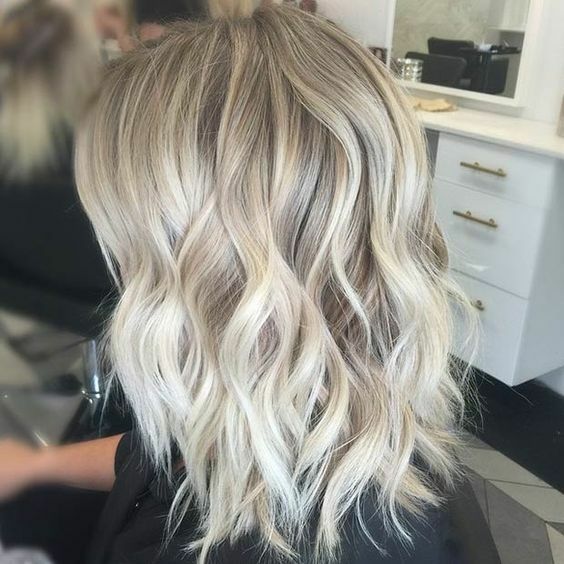 This ashy root with a pure platinum color through the ends and lengths is a great option for women with cool or fair skin tones who are looking for a natural or multidimensional platinum style. A perfect example of how platinum hair with dark roots can work in a sophisticated setting, this high, slick ponytail mixes light blonde sweetness with some raw, rock and roll edge. 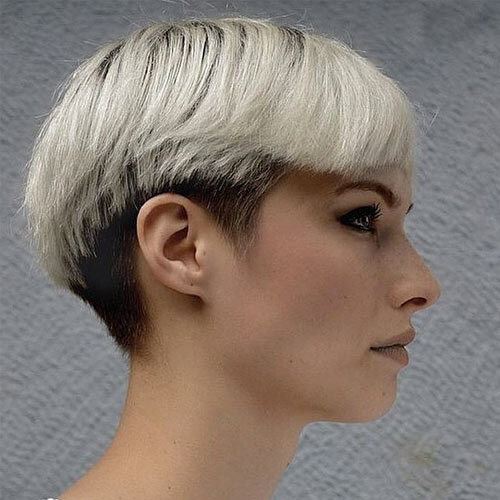 For a short platinum cut that’s surprisingly low-key, this style features a silvery blonde shade on top of a natural dark undercut. The extra color contrast helps give this undercut just as much visual appeal as one where the back and sides are shaved right down. 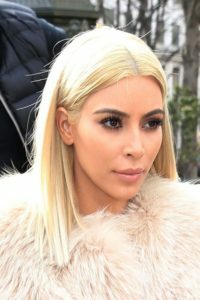 After rising to superstardom as a dark haired beauty, Kim Kardashian’s turn with this golden platinum shade created huge beauty buzz. Her pictured style is a great example of how women with medium or deeper skin tones can pull off the ultimate blonde shade. A supernatural looking style, the dramatic contrast of black roots and silvery platinum lengths makes this look a bold hair choice for equally bold women. 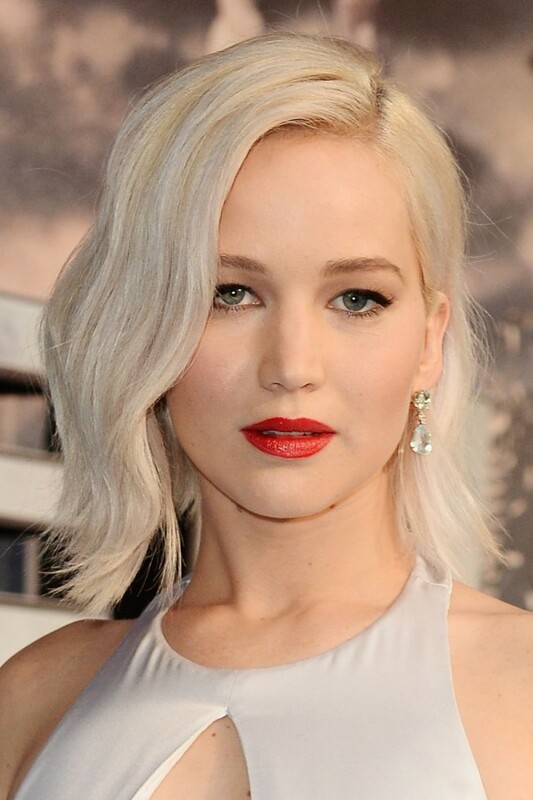 Jennifer Lawrence’s soft waves in a platinum shade ooze Old Hollywood glamour (especially when paired with a red lip), but this bob can also be styled as ultra modern, thanks to its textured ends. 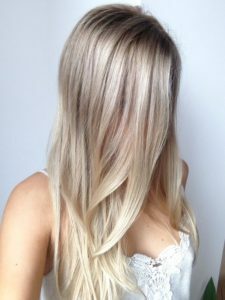 If you’re on the fence about going platinum because you hate the idea of root touch ups, try going for a high ombre style that leaves plenty of platinum in your life while saving you from hitting the salon every four to six weeks. Blunt cuts are a great choice for women with fine hair, but can get a little boring if you’re wearing them all the time. 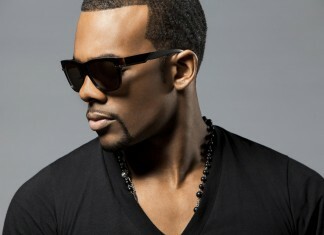 If you really don’t want to sacrifice any of your volume to layers, adding some asymmetry is a great compromise. 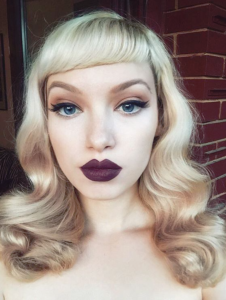 One of the darkest platinum shades on our list, this ashy tone looks great against very fair skin, while the short bangs and waves give off a retro, pin-up feel. This silvery platinum hair is ultra trendy without looking quite like the sterling grey or dove white locks your grandma sports. 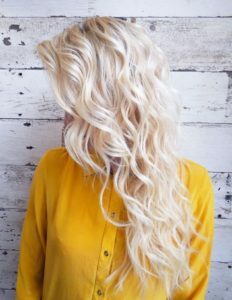 In a loose spiral curl pattern that looks like you’ve just come from a perfect day full of sun, sand, and salt water, these beachy platinum waves will look just as good on a dressed-up night out. If you’re a beach lover in real life, don’t forget to use UV protectant spray on your platinum locks; even if the sun can’t make your hair any lighter, it will still cause damage to your lightened lengths. This shaggy cut is a practical way to shed weight from your thick or unruly head of hair, and also gives off an edgy, rocker vibe. 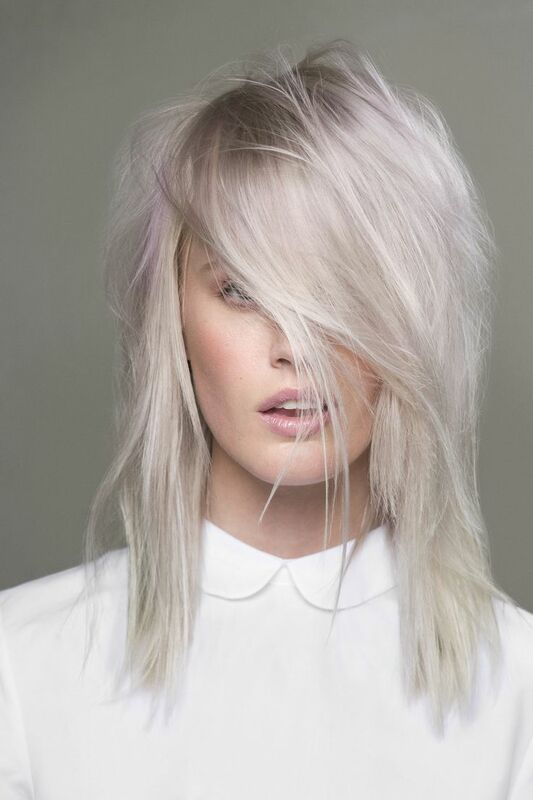 Once you’re already platinum, these subtle lilac highlights are a breeze to add on, and create a soft pop of color when the sun shines on your strands. Fearne Cotton’s soft, ashy shade in a voluminous bob comes across as a more attainable and approachable platinum look than white blonde color on waist length hair. 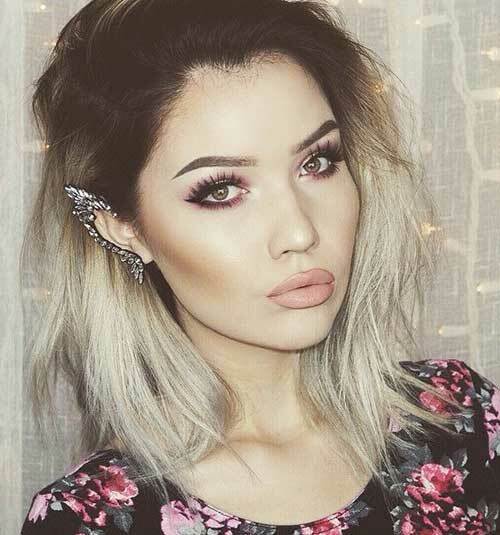 The bottom-heavy shape of this haircut is especially flattering to women with heart shaped faces, as it helps to balance out a larger forehead. Ultra glam style wrapped up in a silvery grey package, this pearly platinum shade will turn heads wherever you go. 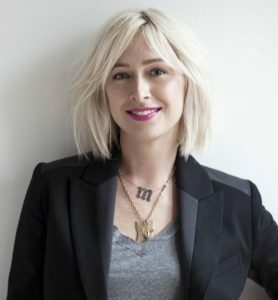 For a grown up way to wear your bright white hair, this bob is the perfect mix of trend and sophistication. 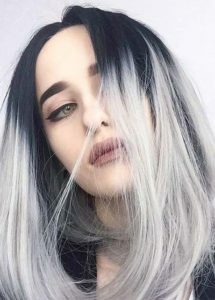 The cut is fairly blunt, but lots of texture in the ends keeps the shape from looking too harsh, while long centre parted bangs create soft lines around the face that are a breeze to style. 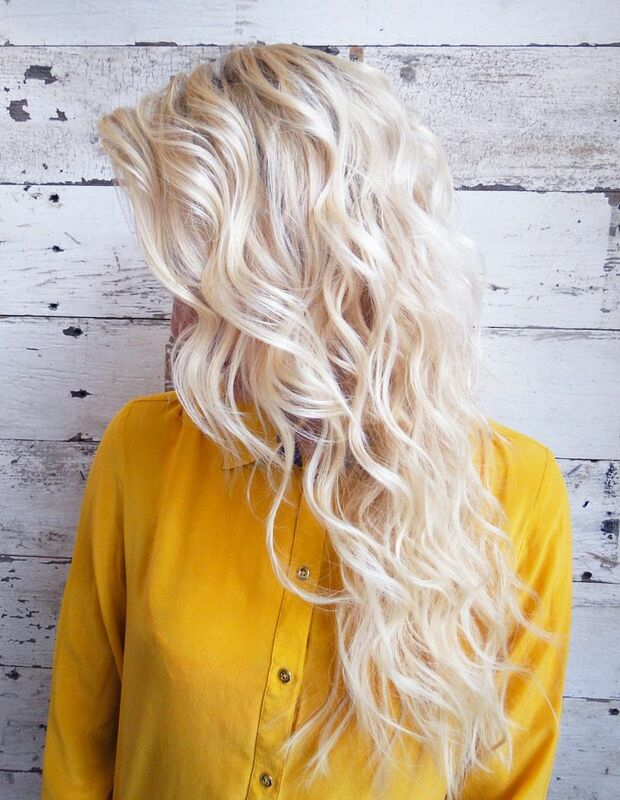 For mermaid hair without the rainbow colors, this ultra long hair full of dreamy waves is the most luxurious way to look like you just rolled out of bed. 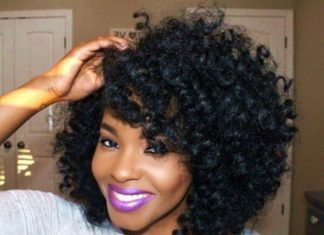 To create these barely-there waves, wrap sections of hair around a curling iron, but keep it brief to prevent them from forming a well-defined curl pattern. You can also try twisting damp hair into buns and leaving overnight to set, but we wouldn’t recommend trying this method for the first time on a morning when your hair needs to be perfect. 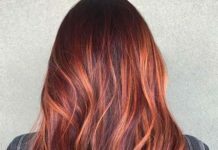 The trendy balayage look doesn’t seem to be going out of style anytime soon, and why would it? 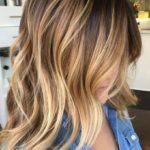 These painted on highlights mimic natural sun lightening, meaning they can be as subtle or bold as you’d like, and add flattering dimension to anyone’s cut or color. 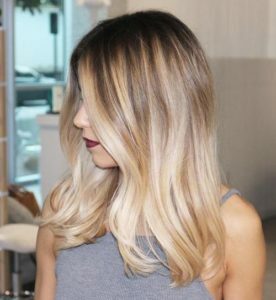 The toasted coconut shade is one of the latest new hair trends that are a must try for all you blondes out there. We love this mix of warm and cold hues all mix together.